For most users, these will likely be more of a novelty than really useful. However, for local search marketers, one of the new beta features appears to me to potentially reveal a bit more than perhaps Google intended. Most of us are familiar with the “site:” advanced search query refinement when conducting Google searches. These allow one to list out all pages indexed for a particular domain, or, when including a keyword with the “site:” command, one can see all pages Google’s indexed on a domain which include that keyword. For instance, to see all pages from CNN, one would conduct a search for “site:cnn.com“. One interesting aspect of Google’s “site:” command is that the pages it returns from a domain are generally returned in ranking order. The highest-ranking pages on a domain are returned first, next-highest returned next, etc. All this goes to show that most of Google’s special search commands will return results in ranking order, with the highest-ranking or highest-PageRank pages returned first. We already know that happens with keyword searches (albeit rank order is not solely based on PR any more — other factors are modifying order, such as various quality criteria and relevancy assessments). But, my point is that within the constraints of many special search commands Google provides, pages are returned to large degree in rank weighting value order. Once you enable this one, a “What’s Around Here?” button is added out beside the “Search Maps” button. It provides a very cool wild-card search capability to the Maps interface. So, if you first search for a map area, then click on this button, you’ll be shown the most-popular places in that mapped area. From a local search marketer’s viewpoint, this wildcard feature is more than just a means to explore popular attractions in various cities. I think it’s potentially an invaluable tool for exploring what criteria factor into Google Maps’ search rankings. This tool provides marketers with a list of the most-popular business listings for any given city! I think the “What’s Around Here?” feature is particularly useful for analyzing very small towns, since business listings in small towns have a lot fewer variables feeding into their search rankings. One can easily list out many of the variables between each business that ranks above another business in smaller towns, then compare those variables to isolate down which elements seem to be more prefered by Google Maps above others. For instance, I love using one of the smallest towns in Central Texas for such comparative analysis – Round Top, Texas. It’s not at all a surprise to me to find Royer’s Round Top Cafe ranking tops for that tiny town, and it’s very telling to see all of the various on-page and off-page elements which factor into its rankings and the other top businesses in that town versus businesses which are ranking lower in Google Maps for that area. 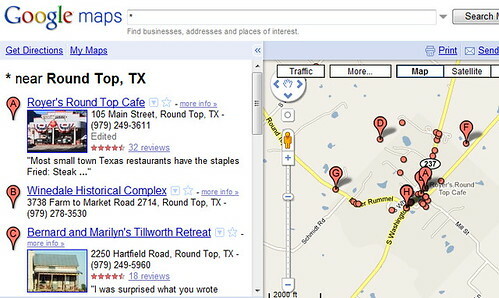 When Google Maps dramatically began introducing PlaceRank elements into ranking during the past year, the change not only added Places which may not be businesses into map results, but it also shifted to an algorithm which attempts to assess the relative popularity of addresses and locations within the maps, independent of business listing data. This paradigm shift added a lot of other factors into rankings that are less business-oriented and less-prone to commercial influences, such as Wikipedia pages about places. Attempting to reverse-engineer Google’s algorithmic ranking methods in order to figure out what factors are more influential or less influential can be very helpful to the marketer or business that desires to change a website to improve its performance, and can make the difference in whether a business achieves landmark icon status in Google Maps versus being lost in the crowd. I think this tip on using the “What’s Around Here?” feature provides really great clues as to what elements work versus what elements are less influential. I probably shouldn’t have revealed this local search optimization “secret” tactic, but it seems like so much of a no-brainer that I couldn’t resist opening a dialogue about the theory. For another source of great info on ranking factors in Google Maps, see also David Mihm’s annual survey of Local Search Ranking Factors. This entry was posted in Google, Local Search, SEO and tagged Google Maps, Local Search, Local Search Engine Optimization, local search marketing, local search optimization, local search ranking factors, local seo by Chris Silver Smith. Bookmark the permalink.